Alex Barlow, Author at D.L. Howell and Associates, Inc.
Why We Need Stormwater Management. Many cities and towns are designed with some sort of stormwater controls in mind to convey runoff from the streets to the nearby waterways. Now, we are discovering that with the increased development of the land around us, the existing infrastructure that we rely on to prevent flooding in our cities and neighborhoods are becoming overwhelmed. In some older cities, the storm and sanitary systems are run through the same pipes. This becomes a problem when we receive large storm events that the combined sewer system can no longer handle, which results in the untreated stormwater and sanitary sewage needing to be released into the surrounding waterways. Last year, Philadelphia, a city which still uses this kind of sewer system, installed two large retention basins to collect runoff from nearby businesses to reduce the amount being conveyed to the existing municipal systems. This, in turn, will reduce the need to open the pipes to the local waterways to relieve the pressure on the system and help prevent pollution to the environment. To construct these systems and maintain the existing infrastructure, many Townships and Boroughs are implementing fees for the maintenance and construction of the stormwater management infrastructure. The fee amount for each property owner is usually decided on a Township/Borough basis and calculated by the amount of impervious coverage that is on the lot. This fee will have more of an impact on businesses as they tend to have a much larger amount of impervious surfaces than the average homeowner. Along with the stormwater fee, all Townships and Boroughs require the use of a stormwater management system to handle the runoff of any new improvements proposed to a property. At D.L. Howell & Associates, our Engineers and Designers are well versed in the design of these stormwater management systems whether they are for a small addition to your house or large basins for new development. Contact D.L. Howell for all your stormwater needs. Importance of knowing where the Floodplain Is. 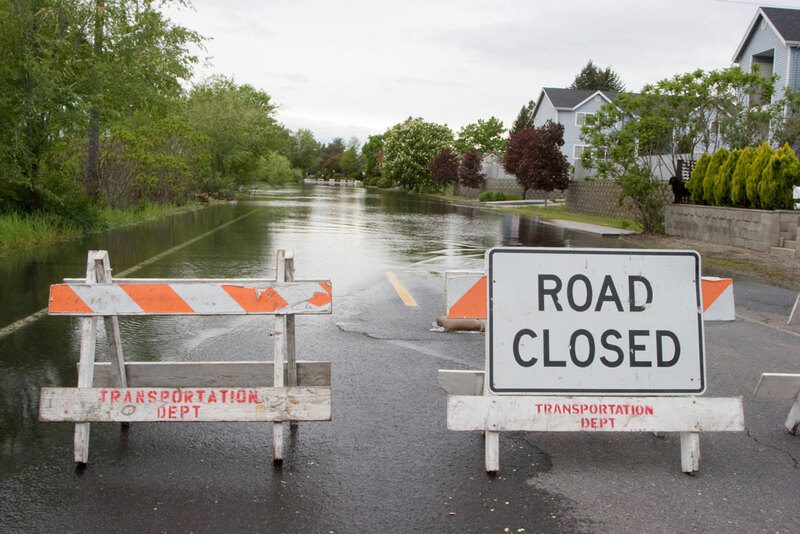 Given the weather and subsequent flooding that has been occurring recently, many officials are looking for ways to reinforce and barricade areas that are most at risk. 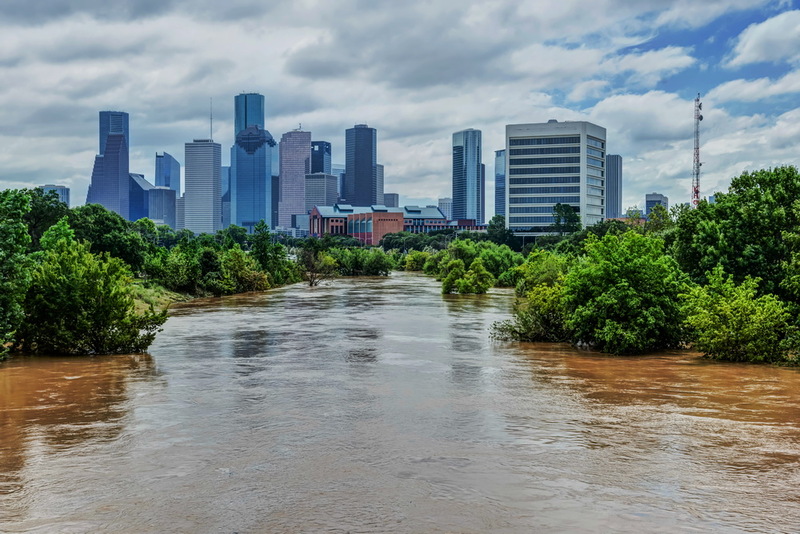 One such area that last year was inundated with flooding was southeast Texas, particularly the Houston Metropolitan area, after Hurricane Harvey. Due to massive amounts of flooding, 68 people lost their lives, and some reports estimate the damage to be over 125 billion dollars. 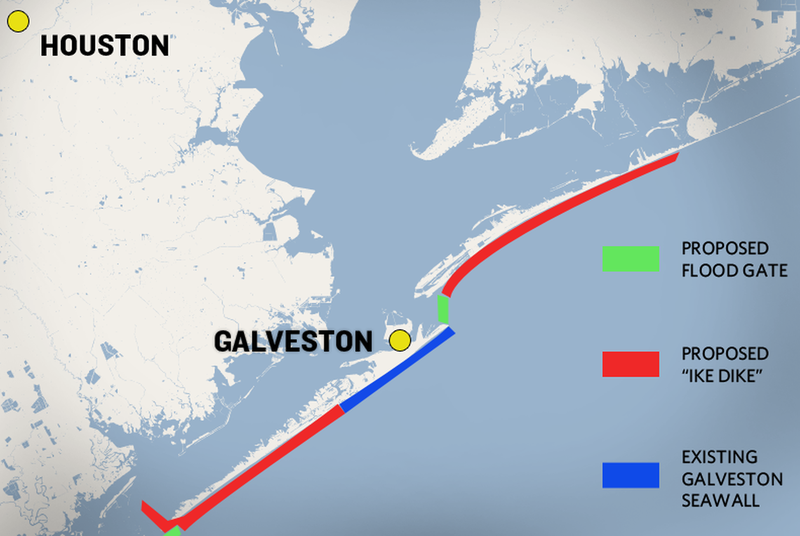 To avoid similar losses in the future, a plan is being proposed to install what is known as an IKE dike along the Bolivar Peninsula that would extend along the rest of the Galveston Island coast to complement the existing seawall. A new floating floodgate is to be installed at the entrance of the Houston Ship Channel that, when built, will be able to be closed to prevent the storm surge from making its way further inland. More recently, Hurricane Florence and Michael devastated parts of the Carolinas and the Florida panhandle this year, with extreme flooding and winds that destroyed many homes and businesses alike. 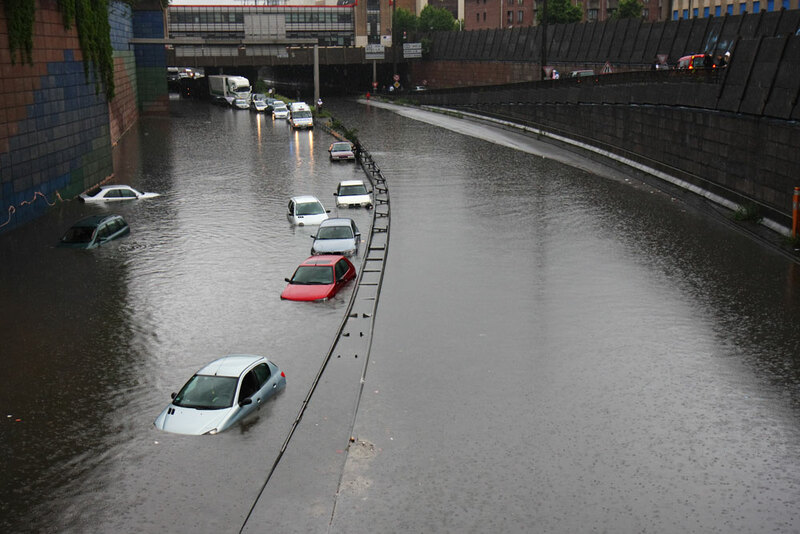 These extreme weather events seem to be a growing trend, and old standards used for the design of stormwater systems and buildings just aren’t cutting it anymore. They are in need of an update, and some are taking notice. FEMA, for instance, has recently been re-evaluating their existing floodplain maps due in part to the massive flooding that occurred after Hurricane Harvey and mainly due to the property damage during Hurricane Michael. 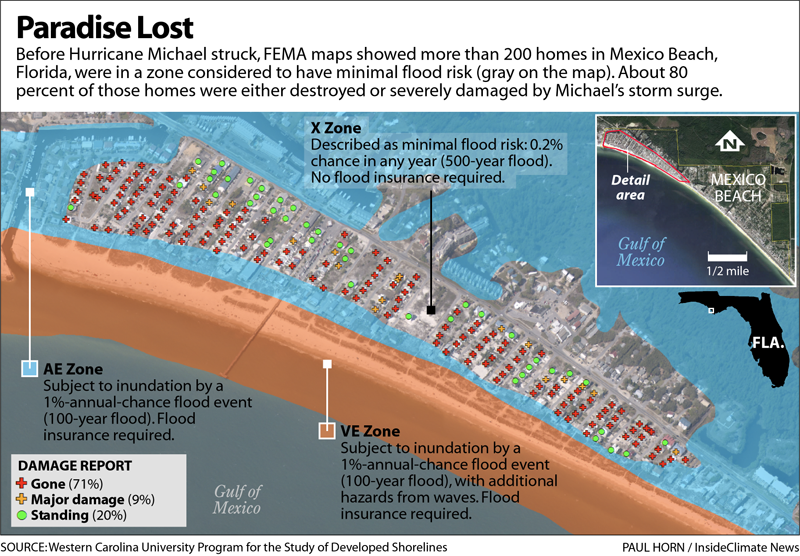 A prime example of where old floodplain maps failed was highlighted by the destruction caused in Hurricane Michael in Mexico Beach, Florida. Although located on the shore of the Gulf of Mexico, some 200 homes were in an area classified as X Zone, which does not require any flood insurance. Most of these homes were destroyed or heavily damaged when the storm surge from the hurricane hit the shores, flooding the area. Flooding is often the element of storms that cause the most damage, and with dynamic and changing landscapes, evaluating land’s susceptibility to flooding events is crucial for the protection of property. Fortunately, D.L. Howell has a team of capable engineers and designers that are able to perform floodplain analysis to determine the effects of a large storm event on your property. 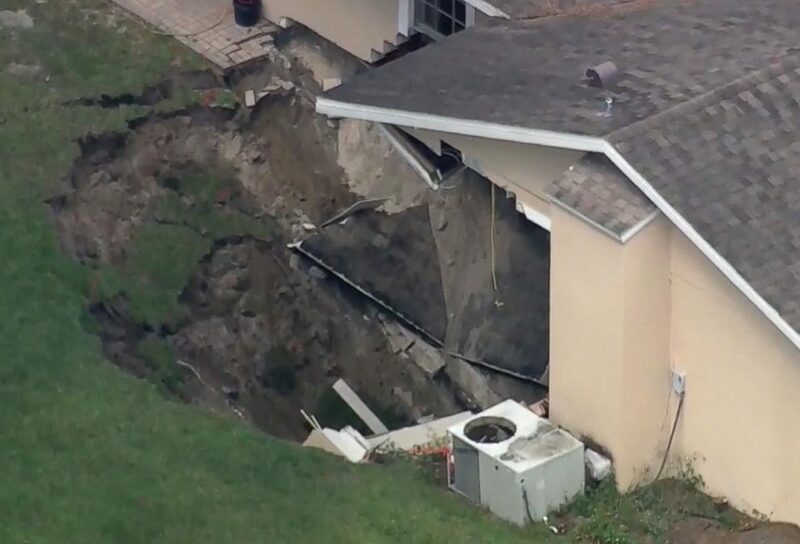 Ever wonder how a sinkhole can seemingly appear out of nowhere and swallow up people’s cars or homes in minutes? Turns out, the makeup of the dirt beneath your feet plays a large part in the creation of these sinkholes. We’ve seen this problem start to occur more frequently over the years in places like Florida, Kentucky, Pennsylvania, and, most recently, the White House. They can vary in size from as small as a foot to large enough to consume an entire building. 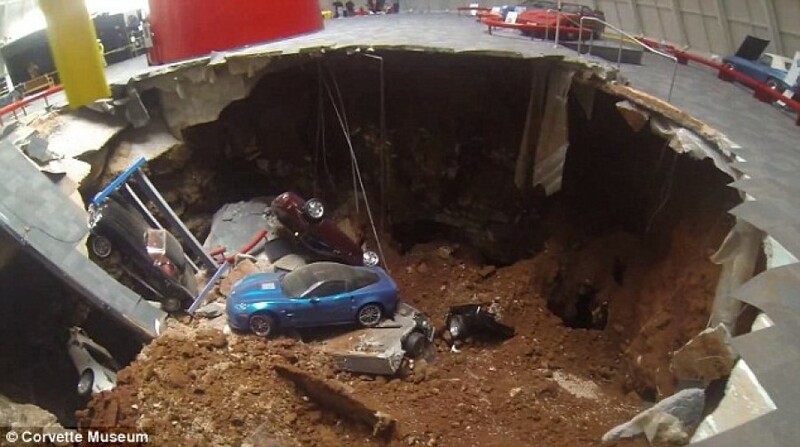 One such instance of this phenomenon occurred back in 2014 when a large sinkhole suddenly opened at the National Corvette Museum, swallowing eight of the Corvettes on display into its depths. Luckily, the sinkhole formed during the night and no one was injured. The building had been up and running for nearly 20 years before this happened. These sinkholes form typically when Karst features, meaning soil and rock composition of either limestone or dolomite, are slowly dissolved over time by water. This leaves a void in the ground that could become unstable and collapse given the right conditions, which means a major problem later down the road. 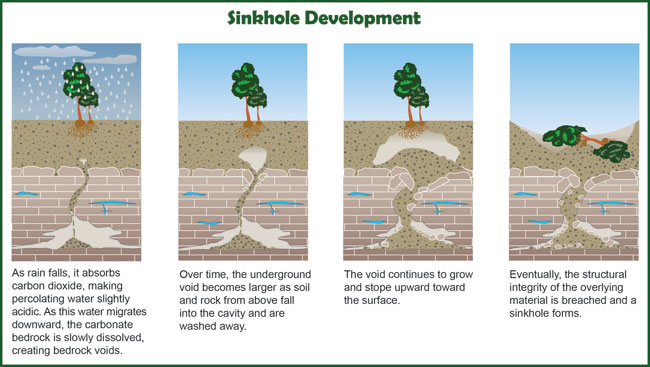 Sinkholes typically take a long time to form, occurring over the span of months or even years. Warning signs typically include rapidly forming depressions and holes in the ground or cracks appearing in walls and pavement. Since there are many karst soil formations in Pennsylvania, it’s an important feature to look for when working on a job that requires the runoff to be infiltrated on site. This can be done by checking eMapPA or hiring a Professional Geotech to take borings across the site and determine if the offending materials are present. If nothing is found: great, business as usual. However, if Karst is detected, then the runoff will need to be mitigated without infiltration. We avoid infiltration beds on sites with karst areas because beds will act as concentrated sources of water which could accelerate or cause the formation of a sinkhole. Depending on the scope of the project, this could require the use of underground storage tanks that will hold the runoff and slowly release it into the Municipality’s storm sewer system. If the site isn’t close enough to connect, then BMPs such as rain gardens, vegetated roofs, and shallow detention ponds can also be used in lieu of infiltration. Come winter, most people prep for the cold by donning warmer clothing and bundling up as the temperature continues to drop. In the event of snow, it’s time to bring out the plows and drop enormous amounts of salt in an attempt to prevent ice from forming. The winter season can be as rough on paved surfaces as it is on people, with drivers adapting to dodging large quantities of potholes appearing on roadways and pedestrians minding where the sidewalk is beginning to lift and crack. Unfortunately, this will continue to be a problem, especially in the northern states, due to the constant freeze and thaw cycle of water trapped in and under paved surfaces. A factor that exasperates this condition is the application of road salt when the temperature is far beneath the freezing point. Rock salt used on roadways is only effective until 20 degrees. Also, even at this lower temperature, the weather is still warmer during the day and colder at night, causing the ice to continually expand and contract within the paving materials leading to further fractures and breaks. Regardless of these facts and the alternative products available, rock salt is the least expensive form of de-icer and most readily available for making paved surfaces safe during the winter months. 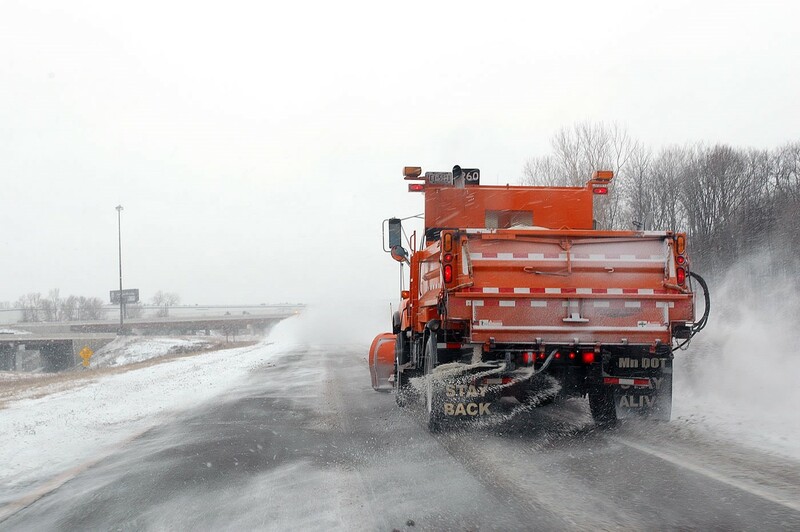 Additionally, plows and other vehicles can unknowingly contribute to the continued damage of paved surfaces already compromised by freezing and thawing. 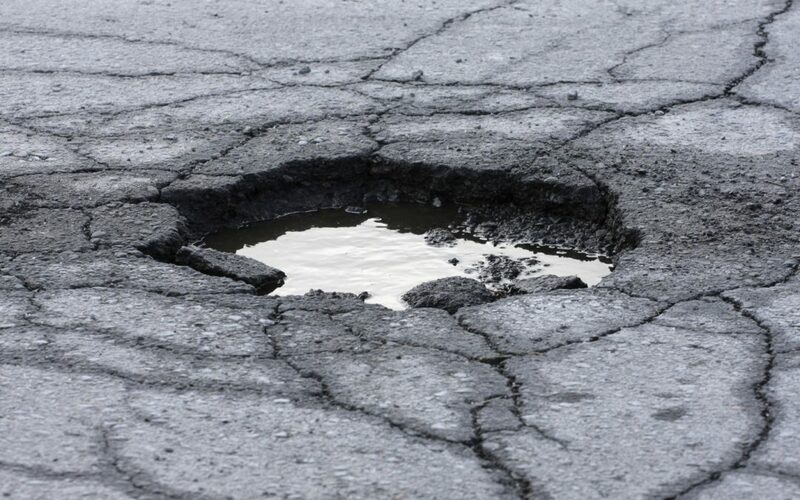 A small divet in a road can quickly become a large pothole with enough vehicles traveling across the damaged portion of pavement. Most plow blades are set at a level that avoids scraping directly along the road surface when clearing to prevent extra wear and tear. This precaution can sometimes be futile due to previously level roads becoming uneven and lifting during the winter months. The edges of plow blades then scrape the surface regardless. Unfortunately, even if we switch to alternative methods of de-icing roads, there will ultimately still be moisture that will freeze and thaw as long as cold weather persists, damaging vehicles and roadways the longer the weather sticks around. To help mitigate this, different asphalt mixtures are used in areas with colder weather to help improve the durability and longevity of roadways and alternative de-icing agents are implemented that will work in weather in which traditional road salt would become ineffective. Water is pretty amazing. It is in everything we do from basic cooking and cleaning to generating hydroelectric power. However, this natural resource can be destructive. Excessive amounts of water at one time can cause significant problems to the surrounding areas if not properly managed in the form of erosion. Erosion is a naturally occurring event where water gradually removes soil and rock from one area and carries it downstream to another where it settles. This is the same process which carved out the Grand Canyon millions of years ago. This process has been accelerated by the development of the land to accommodate new roads, bridges, buildings, and farmland for our ever expanding population. This increased rate of erosion causes problems both at the area where the erosion is taking place and the areas downstream where the soil is being deposited. To help mitigate this problem, sites are developed to control the amount of water is running off of the property. Typically, the idea is to reduce the amount of runoff generated by the new building or parking lot, to what it was before it was developed or some fraction of the predeveloped rate. This is done in an effort to reduce the impact of the new development. Typically the installation of a subsurface infiltration bed or an above ground basin accomplishes this. To prevent soil from leaving the site during construction activities, a combination of silt fencing, socks, sediment traps and other control devices are implemented around the site to control the sediment leaving the site before the ground can be destabilized. These control measures help to prevent sediment from ending up in streets, the neighboring properties, and existing stormwater management systems. 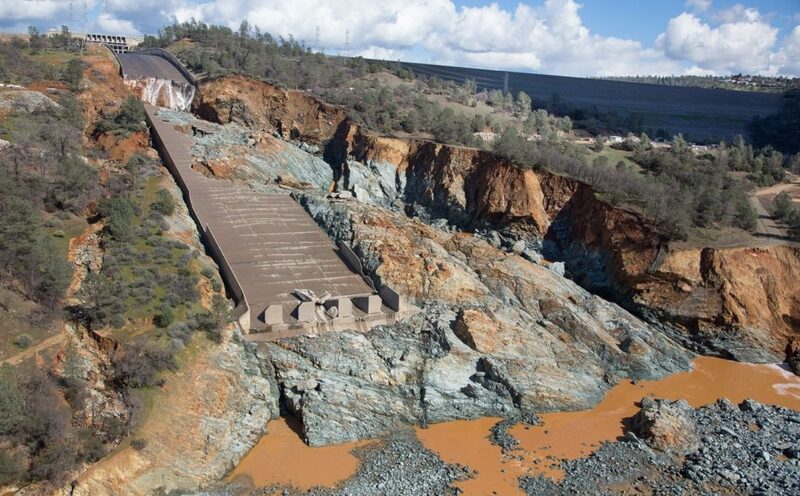 The Oroville Dam and its spillways are examples of the effect that water can have on the surrounding land in large quantities. During January and February, Northern California experienced a record amount of rainfall, the most in 100 years which resulted in a massive amount of water to flow into the Feather River and required the spillway to be opened to release some of the water to bring the dam down to safe levels. Quickly after the initial storm, a second heavy storm event occurred causing, even more, water to be released through the spillway and eventually the emergency spillway. This massive increase in flow eventually started to cause damage with the water quickly eroding the soil underneath and causing chunks of the spillway to be taken downstream and damage Fish Hatcheries, and eventually, lead to the low lying areas downstream of the dam to be evacuated due to concern of the possible failure and collapse of the emergency spillway. Eventually, the water levels were able to be lowered enough that the spillways were able to be closed, with construction workers immediately working around the clock to remove and replace the spillways, filling in the areas eroded away by the high flows, before the arrival of the next winter.